...through the UPAA Germany's Scholarship Fund! The UPAA Germany Scholarship Fund is a continuous project of the association which aims to provide assistance to financially needy and deserving undergraduate students of the University of the Philippines. The first fund raising for the scholarship fund was a benefit concert of the UPLB Choral Ensemble in Berlin on May 11, 2014 organized by Dr. Jingky Lozano-Kühne. The scholarship fund shall be endorsed directly to the University of the Philippines. The selection of scholar(s) and management of the scholarship fund will be handled by the Office of Scholarships and Student Services (OSSS), UP Diliman according to the university's set criteria. Any amount will help a student in need. On the average, a student in the Philippines would need P100 (approx. 2€) for a day's meal. There are of course other student's needs. If you wish to join the pool of funds which will be forwarded to the University of the Philippines as UPAA Germany's Scholarship Fund, we would be glad to accept your donation. Below is our bank account information. Account Name / KONTOINHABER : UNIVERSITY OF THE PHILIPPINES ALUMNI ASSOCIATION GERMANY e.V. To be able to properly acknowledge your donation, please fill up the form below after you transfer your donation or email info@upaagermany.org. Please take note that local money transfer may still take a few days to reach the association's bank account. Once your donation is credited to our account, our treasurer will send you an acknowledgment letter via email, or if requested, a receipt for tax purposes. The turn-over of the scholarship fund to UP will be done every semester or every year depending on availability of funds and donations collated by the association. Fifty-percent (50%) of the yearly UPAA Germany e.V. 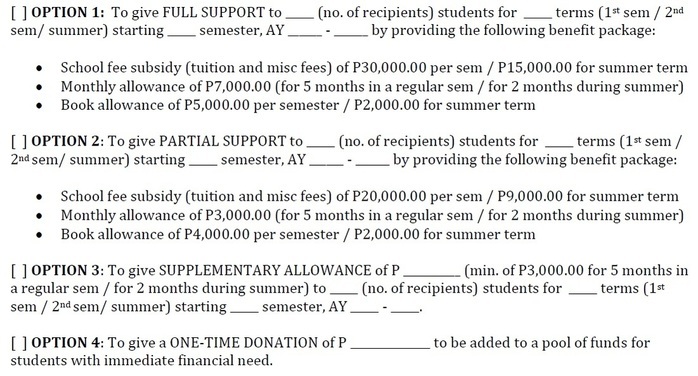 membership fees are allocated to the Scholarship Fund. This is important for acknowledgment receipt of the donation. © 2013 - 2018 UPAA Germany e.V. All rights reserved.